People like saying, ‘X, Y, Z is dead!’ Maybe it makes them feel bold. There’s nothing like a new start, is there? Or a revolution. But what often happens after they’ve said X, Y, Z is dead is that the new start actually consists in settling for less, and making a smaller effort. This seems to have been the case with readers and writers, ever since a smart Alec called out, ‘Modernism is dead!’; which brings us to the subject of a new book by Gabriel Josipovici, What Ever Happened to Modernism? Professor Josipovici argues that the English novel has become caged in recent decades, and that its famous practitioners have been putting on a tame show, for all their swaggering. This has annoyed the literary reviewers and metropolitan columnists, who’re in the habit of making a fuss of certain big names, and don’t appreciate being told they’ve been cheering cows; but it happens to be true. The ranking writers and the prize-winners make it solely because the idea has caught on that ‘Modernism is dead’; the consequence of this is that contemporary writing can prowl about quite safely in its cage, or not prowl at all but just peep through its fingers. La Rochelle by Michael Nath was shortlisted for James Tait Black Memorial Prize for Fiction. 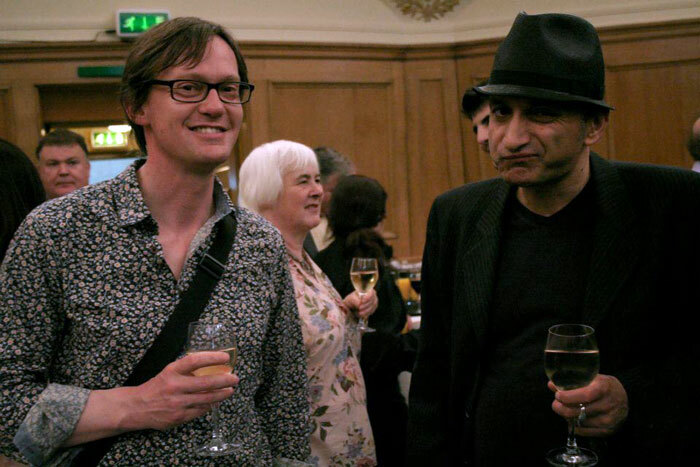 Michael Nath and a small party turned up at the Edinburgh Book Festival on Friday night for the James Tait Black Memorial Prize award ceremony. Michael’s book was one of four shortlisted titles in the running for the award. The fiction prize eventually went to Tatjani Soli for The Lotus Eaters on the night, but there was a lot to be taken from the event. Not least of which was the fine hospitality of the Edinburgh University English Department and the Edinburgh Book Festival, but also the fine words spoken about the book by Dr Lee Spinks, the chair of the judges panel for the fiction award. Dr Spinks’s appraisal of the book can be seen in the above video. La Rochelle by Michael Nath has been shortlisted for the James Tait Black Memorial Prize, one of the oldest and most prestigious book prizes awarded for literature written in the English language and Britain’s oldest literary award. The James Tait Black Prizes were first presented in 1919. There are two awards, given respectively to works of Fiction and Biography written in English and published in the previous calendar year. Each is worth £10,000 to the winner. The awards were set up by the widow of James Tait Black, one of the founders of the publisher, A & C Black. The winner is selected by the Professor of English Literature at Edinburgh University, assisted by PhD students. The absence of critics or any other ‘celebrity’ judges, along with the prizes’ considerable heritage, make them among the most respected awards in publishing. Authors may only win each award once; no author has yet managed to win in both categories. The prizes’ pedigree is confirmed by the many illustrious names who have won. The Fiction Prize has been given to, amongst others, E M Forster, Siegfried Sassoon, Aldous Huxley, D H Lawrence, Evelyn Waugh, Muriel Spark, Iris Murdoch, Beryl Bainbridge, Angela Carter, John le Carré and Bruce Chatwin. Biographers honoured include Lytton Strachey, Antonia Fraser, Richard Ellman, Martin Amis, Victoria Glendinning, Gitta Sereny and Michael Holroyd. Four victorious authors have gone on to be awarded the Nobel Prize for Literature, William Golding, Nadine Gordimer, J M Coetzee and Doris Lessing. The winner will be announced at ceremony at the Edinburgh Book Festival in August. The video clip presented above shows footage from last year’s ceremony. Full details of the shortlist can be found here. A full list of previous winners and background information on the prize can be found here. Click here for more details on La Rochelle. Trailer for Michael Nath’s novel La Rochelle. (2:38) A one take shot of Michael walking down Love Lane, Pontefract. We only had fifteen minutes to film it as we had to get back for the serving of the paella. Music is by Nick ‘The Hat’ Pearson of Psychicbread.